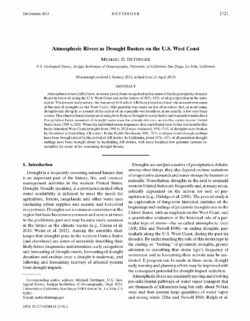 Atmospheric rivers (ARs) have, in recent years, been recognized as the cause of the large majority of major floods in rivers all along the U.S. West Coast and as the source of 30%–50% of all precipitation in the same region. The present study surveys the frequency with which ARs have played a critical role as a common cause of the end of droughts on the West Coast. This question was based on the observation that, in most cases, droughts end abruptly as a result of the arrival of an especially wet month or, more exactly, a few very large storms. This observation is documented using both Palmer Drought Severity Index and 6-month Standardized Precipitation Index measures of drought occurrence for climate divisions across the conterminous United States from 1895 to 2010. 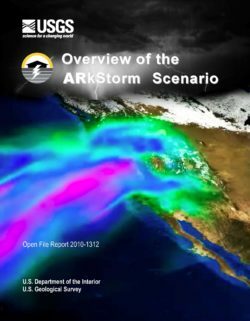 When the individual storm sequences that contributed most to the wet months that broke historical West Coast droughts from 1950 to 2010 were evaluated, 33%–74% of droughts were broken by the arrival of landfalling AR storms. In the Pacific Northwest, 60%–74%of all persistent drought endings have been brought about by the arrival of AR storms. In California, about 33%–40% of all persistent drought endings have been brought about by landfalling AR storms, with more localized low pressure systems responsible for many of the remaining drought breaks. 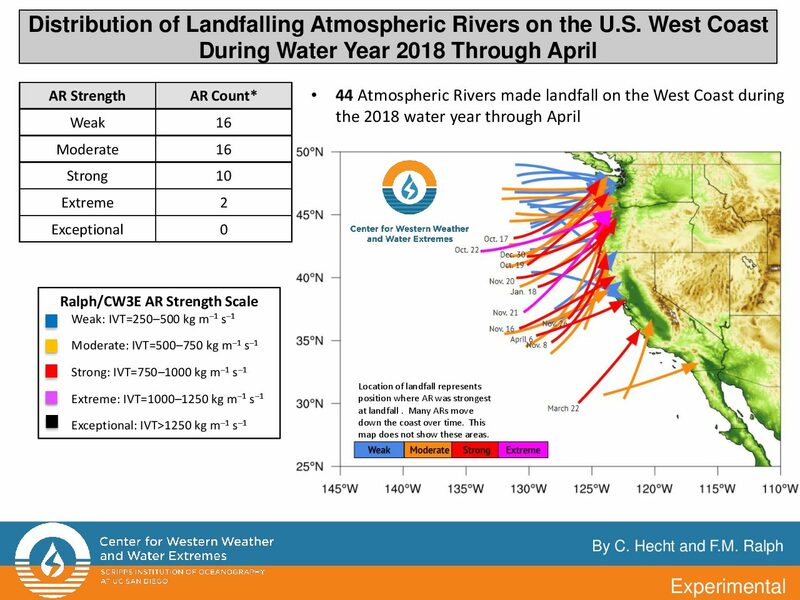 Forty-four atmospheric rivers (ARs) made landfall on the West Coast during the 2018 water year through April compared to 68 the year before, report meteorologists Chad Hecht and Marty Ralph from the Center for Western Weather and Water Extremes, Scripps Institution of Oceanography at U.C. San Diego. This notes the ARs' landfall patterns, strength, geographic distribution, and timing. 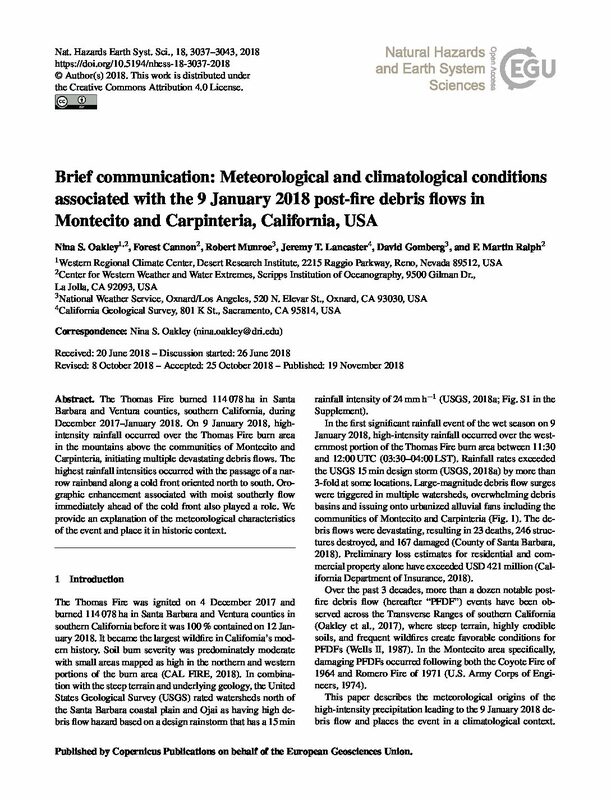 Mediterranean climate regimes are particularly susceptible to rapid shifts between drought and flood—of which, California’s rapid transition from record multi-year dryness between 2012 and 2016 to extreme wetness during the 2016–2017 winter provides a dramatic example. 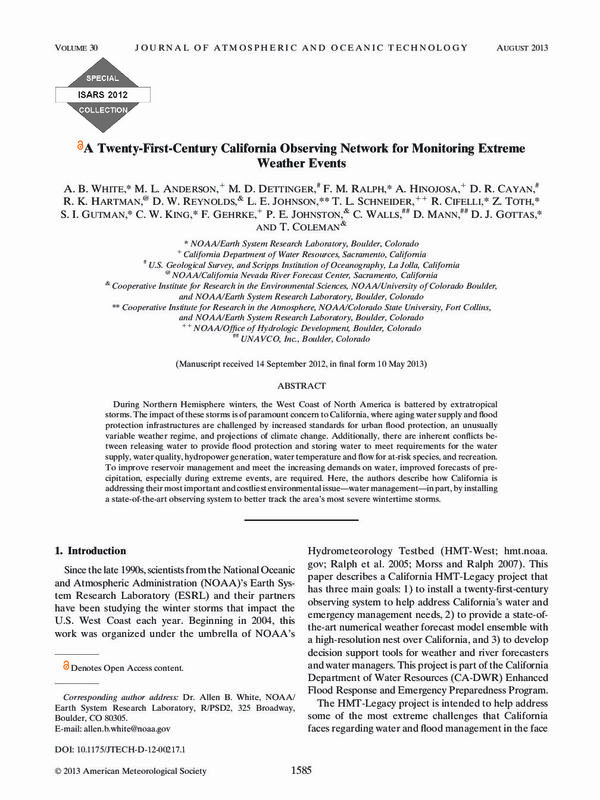 Projected future changes in such dry-to-wet events, however, remain inadequately quantified, which we investigate here using the Community Earth System Model Large Ensemble of climate model simulations. 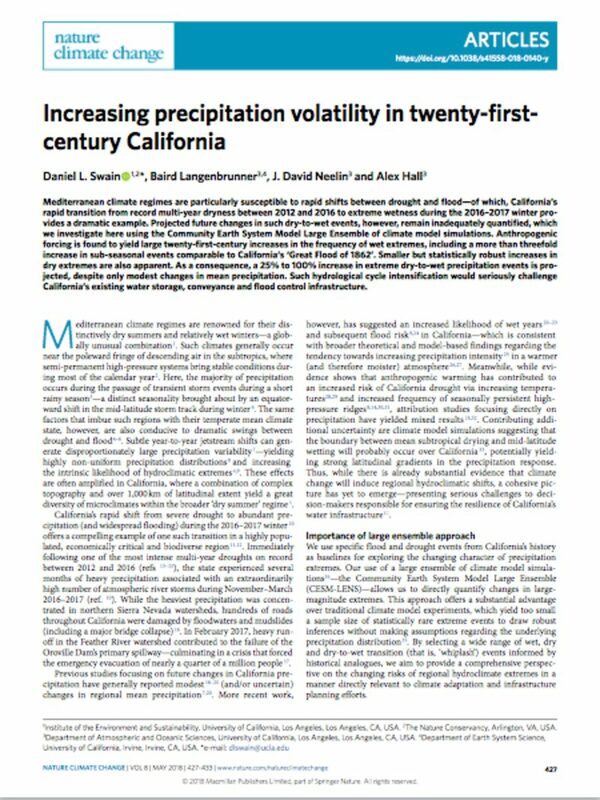 Anthropogenic forcing is found to yield large twenty-first-century increases in the frequency of wet extremes, including a more than threefold increase in sub-seasonal events comparable to California’s ‘Great Flood of 1862’. Smaller but statistically robust increases in dry extremes are also apparent. 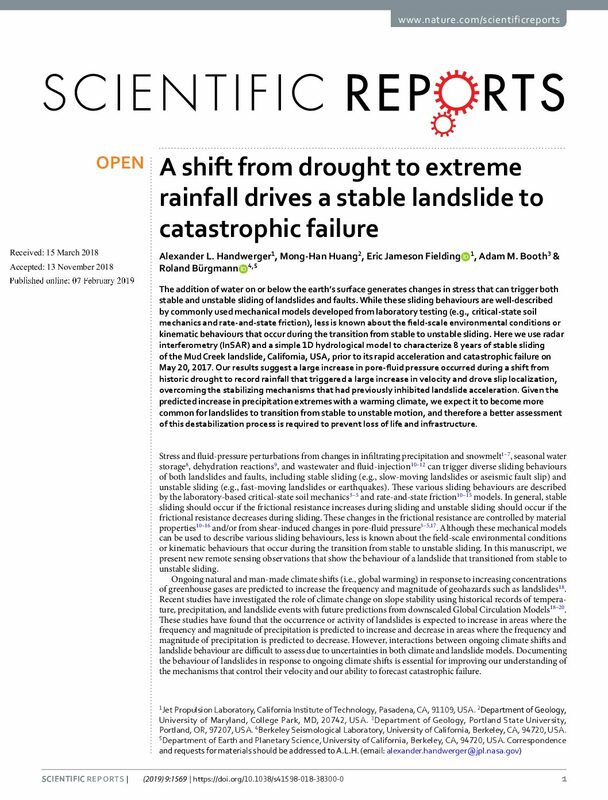 As a consequence, a 25% to 100% increase in extreme dry-to-wet precipitation events is projected, despite only modest changes in mean precipitation. Such hydrological cycle intensification would seriously challenge California’s existing water storage, conveyance and flood control infrastructure. In early 2017, northern California experienced record-setting levels of precipitation. The amount of rain and snow from October 2016 through February 2017 was the greatest in the 122 years of California record-keeping. As the reservoir behind Oroville Dam quickly filled to capacity, a torrent of excess water was let out through the main spillway. Shortly thereafter the spillway began to collapse, leading to massive soil erosion and concerns that the erosion could undermine the dam itself. Fears of a catastrophic dam breach led to the evacuation of around 180,000 residents downstream from the dam. While we do not know how much climate change contributed to this particular event, we do know that climate change is making extreme events more common (Black et al. 2016; Mote et al. 2016; Otto 2016). 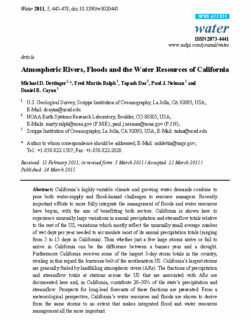 While reports indicate that management failures may have played in an important role in the Oroville disaster, it is also true that this event took place in the context of extreme weather, and that climate change is increasing pressure on structures and communities. This finding is not limited to highprofile infrastructure such as the Oroville Dam. Much of our water infrastructure, management tools, institutions, and planning mechanisms are not designed for the increased magnitude and frequency of such extremes—making the state, its environment, and its water resources vulnerable to the changes we are likely to see in the coming decades. In California, groundwater contributes more than half of the state’s water supply during dry years (DWR 2009). Therefore, understanding the impacts that climate change will have on this critical resource will be of particular importance for the state’s water and food security over the long term. To that end, Governor Jerry Brown issued Executive Order B-30-15 that, along with setting ambitious greenhouse gas reduction targets, requires state agencies take climate change into account in their planning and investment decisions. 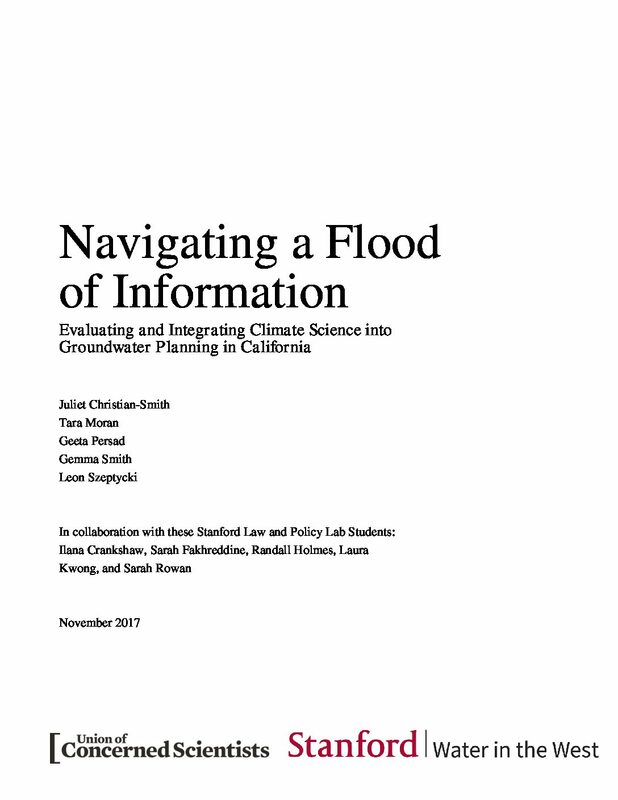 In addition, California’s Sustainable Groundwater Management Act (SGMA), passed by the legislature in 2014, requires that Groundwater Sustainability Agencies (GSAs) explicitly assess the impacts of climate change and incorporate these assessments into their Groundwater Sustainability Plans (GSPs). Under the legislation, GSAs must develop and implement GSPs to achieve sustainable groundwater management in all high- and medium-priority groundwater basins in the state. Within these plans, GSAs are required to provide “[p]rojected water budget information for population, population growth, climate change, and sea level rise” (CWR 354.18(d)(3)). Additionally, projected water budgets must “identify the uncertainties of these projected water budget components,” including uncertainties in projected hydrology, water demand, and surface water supply resulting from sea level rise, land use changes, population growth, and climate change (CWR 354.18(c)(3)). To meet these regulatory requirements, plans must “rely on the best available information and best available science to quantify the water budget for the basin” (CWR 354.18(e)). Yet, it can be difficult to identify the best approach to incorporating climate change into local plans. The purpose of this white paper is to assist in that challenging task. Recognizing the importance of climate change impacts on the state’s water supply, the California Department of Water Resources (DWR) has devoted a significant amount of time and expertise to integrating climate change into water planning. In 2012, DWR convened the Climate Change Technical Advisory Group (DWR CCTAG) to advise DWR on the scientific aspects of climate change, the impact of climate change on water resources, the use and creation of planning approaches and analytical tools, and the development of adaptation responses. The DWR CCTAG released a report in 2015, Perspectives and Guidance for Climate Change Analysis, which makes several recommendations for future work. One central theme is the need to develop guidance and support for water managers and planners. Factoring climate change into water management decisions requires future projections of how climate change will impact water-relevant factors such as temperature and precipitation—projections that are generally derived from global climate models. However, incorporating climate change into water planning for any given community or groundwater basin can be difficult, not only because of the technical expertise required to do so, but also because the effects of climate change are spatially and temporally variable. Although the scientific community has high confidence in a key set of variables for the planet as a whole, translating global estimates of climate change to specific geographical areas creates uncertainty. Fortunately, there are tools and methods to address uncertainty. As is the case for other natural phenomena that are difficult to predict with precision, such as earthquakes, uncertainty cannot be an excuse for inaction. Scientific and technical tools can substantially assist in creating plans that cope with an uncertain future. This white paper does not directly address the role of hydrologic models themselves, but rather addresses how climate change information can be incorporated into hydrologic models as water managers seek to comply with the requirements of SGMA. The process of incorporating climate change into water management decisions has several steps, starting with running global climate models to produce future climate projections, which are then used as inputs to hydrologic models (Figure 1). We recognize that GSAs are likely to engage at different levels of technical sophistication with climate data and that the majority will seek out the services of technical experts. Ultimately, it is our intent that this white paper equip water managers with sufficient knowledge about climate change projections to understand, evaluate, and direct the work of the technical experts and consultants. Using appropriate climate change information is vital to ensuring that water managers capture potential future water resource conditions. This white paper is organized into three main sections. The first section provides a general overview of climate models, including their strengths and limitations and the type of information they can provide, and describes a framework for incorporating their output into management decisions. The second section addresses how to incorporate climate change into planning involving imported water supplies. The third section turns to planning for local water supplies and proposes a process for incorporating appropriate climate change data into GSPs. and other coastal communities. Windspeeds in some places reach 125 miles per hour, hurricane- force winds. Across wider areas of the state, winds reach 60 miles per hour. Hundreds of landslides damage roads, highways, and homes. Property damage exceeds $300 billion, most from flooding. Demand surge (an increase in labor rates and other repair costs after major natural disasters) could increase property losses by 20 percent. Agricultural losses and other costs to repair lifelines, dewater (drain) flooded islands, and repair damage from landslides, brings the total direct property loss to nearly $400 billion, of which $20 to $30 billion would be recoverable through public and commercial insurance. Power, water, sewer, and other lifelines experience damage that takes weeks or months to restore. Flooding evacuation could involve 1.5 million residents in the inland region and delta counties. Business interruption costs reach $325 billion in addition to the $400 billion property repair costs, meaning that an ARkStorm could cost on the order of $725 billion, which is nearly 3 times the loss deemed to be realistic by the ShakeOut authors for a severe southern California earthquake, an event with roughly the same annual occurrence probability. 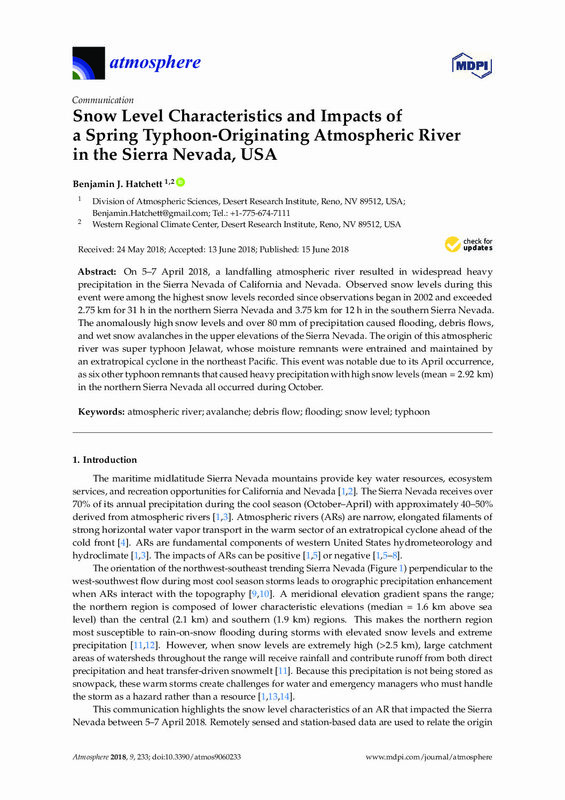 On 5–7 April 2018, a landfalling atmospheric river resulted in widespread heavy precipitation in the Sierra Nevada of California and Nevada. Observed snow levels during this event were among the highest snow levels recorded since observations began in 2002 and exceeded 2.75 km for 31 h in the northern Sierra Nevada and 3.75 km for 12 h in the southern Sierra Nevada. The anomalously high snow levels and over 80 mm of precipitation caused flooding, debris flows, and wet snow avalanches in the upper elevations of the Sierra Nevada. The origin of this atmospheric river was super typhoon Jelawat, whose moisture remnants were entrained and maintained by an extratropical cyclone in the northeast Pacific. This event was notable due to its April occurrence, as six other typhoon remnants that caused heavy precipitation with high snow levels (mean = 2.92 km) in the northern Sierra Nevada all occurred during October.